The sun is so hot right now (100 degree days). Our air-conditioning went out, of course, but my brilliant husband remembered we had a window unit stored in the barn and fixed it in the kitchen. Luckily, our upstairs bedroom has a mini-split, so we have somewhere cool to sleep. Oh well, the world doesn't stop. My husband got a weathervane for his birthday and chose to put it on the barn. We have continued to work on items for our youngest's apartment and are in the process of making an end table and a platform bed. 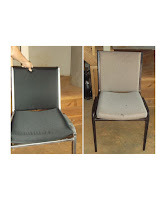 I have reupholstered four stacking chairs in a black suiting fabric with a shiny surface, and painted the metal part silver. I also came up with an idea today of making a coat rack out of a scrap piece of wood, some old knobs and some silver paint. I finished a pair of curtains and two pillows for the chairs. Most of this stuff I am posting on my pinterest page, so you will get a better idea of how it looks together if you look there. There is a link on this page. We are picking zucchini squash, yellow squash and raspberries right now. The beans are almost ready to be picked. Don't forget to check out the updated picture of the Solar Water Heater collector. Hi Sherri! Hopefully you've gotten some of the blessed temperature relief that finally reached the southeast. We actually decided not to use our A/C this summer, which was a challenge, but I think a good decision. We'd pull in cool air at night with fans, and close up when the outside temps climbed. All the energy efficient improvement we've made on the house helped here: energy star windows, better insulation, etc. so that it stayed 10 to 15 degrees cooler in the house than outside. I won't deny that I was really tired of being hot by the time the rains came!